Below are some of the frequently asked questions and answers in regards to McWane Poles. If you need more product information, or would like to speak to a specialist, please submit a request. Isn’t ductile iron a brittle material? No. Unlike cast iron, ductile iron is a pliable material. This is because of ductile iron’s carbon structure. Alloys are added during the melting process that transform the flaky carbon structure of cast iron into a spherical structure. This nodular carbon orientation gives it ductility and strength while maintaining the corrosion resistance of cast iron. When you say ductile iron poles are “Green”, what does that really mean? McWane Poles are made of 96% recycled cars, appliances, and other metals. And at the end of a McWane pole’s service life, we can actually melt that pole down and produce another pole from the same material. McWane Poles are 100% recyclable. Do you need special equipment for installation? No. Ductile iron poles weigh approximately 45 percent less than wood and 25 percent more than steel. Our heaviest pole weighs approximately 3,200 pounds. As a result, your existing equipment is ideal for installations. Can you provide the poles in sections to allow field assembly? Yes. In most cases, we are shipping fully assembled poles. We press fit the joints in a 50-ton press and pin them. We do offer sizes 55’ and greater in two pieces as an option. What is the end of life salvage value anticipated to be? Salvage value will be determined by future market scrap values. Do you have RUS approval? RUS does not approve any utility poles regardless of material. However, RUS requires that the funding application list materials to be used with the funds requested. Therefore, all poles, regardless of materials, are to be specified in the paperwork to be filed. McWane Poles have been purchased in many instances using RUS funds. How does the strength compare to wood? We have designed our poles to the equivalent of wood pole grade “B” construction. As an advantage our poles are engineered with predictable minimum strength and dimensional consistency. How will ductile iron poles behave on impact - like wood, steel, cast iron? Results will vary depending on the size and speed of the vehicle. Generally, ductile iron poles will react to impacts similar to what is experienced from wood and steel. What type of ground line protection do you provide? 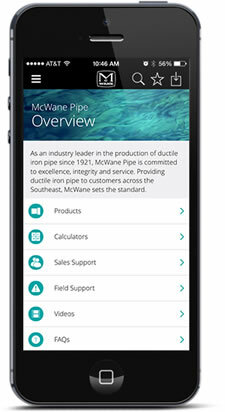 McWane has manufactured iron pipe since 1921 and ductile iron pipe since the 1950’s, so we have extensive knowledge of underground protection. For maximum protection, McWane Poles uses a ceramic epoxy as our embed coating. We coat the pole embed, inside and out, to one foot above the ground line. Do you galvanize ductile iron poles? No. Due to the silicate content of ductile iron, dipped galvanizing does not adhere well. However, McWane gains similar protection with arc-applied zinc. This is a process of electrically melting zinc wire and applying it to the pole. On top of the zinc coating, we apply an acrylic top coat for a premium appearance. Do I need special hardware to mount equipment to ductile iron poles? No, the hardware you currently use with wood and steel will work with McWane Poles. In some cases, a separate Gain may be preferred when using wood cross arms. These are available from various parts suppliers. Yes, we include up to 20 through-hole penetrations in the price of the pole, and we will drill to your specifications if more holes are required for a nominal charge. Can ductile iron poles be drilled in the field? Yes, ductile iron poles are very easy to field drill. We recommend a carbide-tipped hole saw bit for the best results. Many utilities also use step type bits. What coating do you offer? We offer two finish options. First, we offer a Natural Finish pole, which is bare iron and looks similar to a wood pole finish. Due to the inherent corrosion resistance of ductile iron, our Natural Finish poles last longer than weathering steel. Our second finish option is an arc applied zinc base coat with an acrylic gray top coat. This coating process is commonly used in the water industry for valves and pipe. Customer colors are available for large orders. Why are the poles not galvanized? Due to ductile iron’s high silicate content, dip galvanizing does not achieve sufficient bonding. We offer an arc-applied zinc (a.k.a. thermal spray) coating. This method is accepted worldwide for enhanced ductile iron protection. For added pole protection, we apply an acrylic top coat. If we chose the Weathered Finish will the poles slowly rust away? Bare ductile iron will not slowly rust away and will last longer than weathering steel. Ductile iron, or any other metal product, is most exposed for material degradation at the ground line and below grade. For maximum embed protection, McWane Poles uses a ceramic epoxy coating called Permasafe. Permasafe was patented in 1979 especially for corrosive environments and has an excellent record of performance. Since ductile iron poles are heavier than plate steel, will equipment and labor be incrementally higher? No. Our 65’ H-3 and 70’ Class I poles are the heaviest poles we manufacture. These poles weigh between 2,900 and 3,200 pounds. The typical boom truck is rated for 7,000 pounds, so all of our poles can be installed by your standard equipment. Are ductile iron poles less flexible than plate steel poles, making them less compatible with guys? No. Our poles are slightly stiffer than steel poles, but ductile iron demonstrates very good deflection. Are ductile iron poles more brittle than steel, making them more susceptible to breakage due to accidents with cars or farm equipment? No. One the biggest misconception about ductile iron is that it is a brittle material. Cast iron is brittle, but due to ductile iron’s carbon structure, our poles have unique flexibility and strength. It appears that there are two or more pinned slip joints on typical poles. Do these joints and the inherent weight of the pole make them difficult to handle? No. We use a rivet nut and bolt for mechanically pinning the poles together. In customer feedback of installations, none of the crews thought the poles were difficult to install or hard to handle. In a few of the locations, line crews like our poles better than wood and steel, citing that our poles are easier to install than wood and just as easy as installing steel. Will joints require a bonding jumper to guarantee electrical grounding of the pole? No jumper is required. We retained a third party engineering firm for conductivity testing, and our poles achieved 2,000 micro-ohms impedance. This is similar to No. 4 copper.